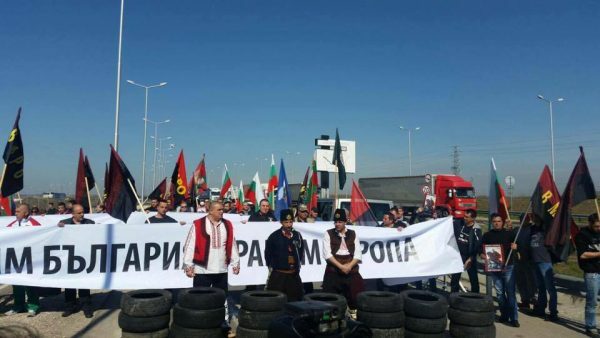 Supporters of Bulgaria’s nationalist United Patriots coalition blocked border checkpoints with Turkey on the morning of March 21 in a bid to prevent buses and cars coming into Bulgaria, bringing people to vote in Sunday’s parliamentary elections. Soon after 10am, traffic at the Kapitan Andreevo border checkpoint was blocked, and at about 10.50am, the Malko Turnovo checkpoint was barred. Organisers of the blockade also planned to shut down the Lesovo border checkpoint. Participants told reporters that they had information that 1000 buses with voters were expected to cross the border ahead of the March 26 early parliamentary elections. The protesters said that they were willing to remain at the border checkpoints until election day. There was a heavy police presence at the checkpoints, Bulgarian National Radio said. The protesters arrived in three buses from the Black Sea city of Bourgas, as well as in dozens of private cars. Police checks slowed the arrival of the protesters. On the morning of March 21, Bulgarian television station Nova Televizia aired a report about free bus transport being provided by political parties for people to come to Bulgaria. Buses were reported to be travelling from Istanbul and Bursa. Nova’s report said that in Bursa, a sign on a wall at a travel office offered free transport from Istanbul to Bulgaria, showing bus departure times. So far, the trips had been arranged by giving travellers free tickets for regular bus routes. The report did not name the political parties, but two have electoral strongholds in Turkey – the Movement for Rights and Freedoms, and DOST. There have been tensions in recent weeks between Bulgaria and Turkey over Ankara’s intervention in Bulgaria’s parliamentary elections. A number of political parties have called for limiting or shutting down polling stations in Turkey, while the United Patriots previously have called for – among other things – closing the border with Turkey to prevent “electoral tourism”.